Scope Node Mouse – "Like You're Holding A Pen" | OhGizmo! 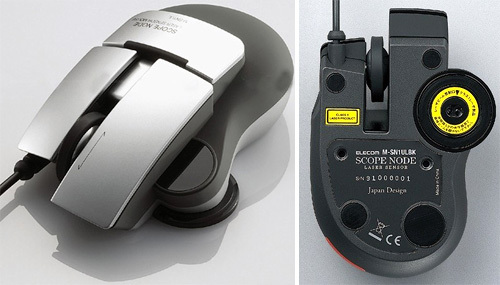 In one of their ads, Elecom claims their new Scope Node Mouse is “like you’re holding a pen.” Now I’m pretty sure they’re not going to sway the Wacom crowd with that claim, but as you can see in the photo of the underside of the mouse, the 1600 DPI laser sensor has been placed off-center so that it sits closer to where the tip of a pen would land when held in your hand. Supposedly that results in a more precise mousing experience. It’s also got a bizarre exposed scroll wheel, though I imagine that design reduces the amount of crap that ends up getting trapped inside the mouse. So I’ll upgrade that feature from bizarre to clever. At the moment the Scope Node M-SN1UL is only available in Japan, but you’ll probably be able to find one online eventually. I just purchased this mouse in japan and have installed it. I must say it does seem extremely precise!!! Just be sure to bring the speed down on it through the control panel until you get used to it. The design of the mouse is unique and feels good in the hand.